10 Timely Facts About 48 Hrs. Thirty-five years ago, Eddie Murphy was a rising comedian with a promising future in the world of stand-up comedy. Quickly becoming one of the biggest stars of Saturday Night Live, the kid from Brooklyn took a chance with his career in 1982 and tried his hand at acting in a film about a gruff detective who needs the help of a wise-cracking convict to catch a killer. 48 Hrs. showed the world that Murphy had range and became the doorway to a storied career that still has legs. 1. IT WAS EDDIE MURPHY’S FIRST FILM ROLE. 2. NOT BEING FUNNY ALMOST GOT MURPHY FIRED. While sitting down with James Lipton on Inside the Actors Studio, the comedian revealed that, unbeknownst to him, there were talks behind the scenes of 48 Hrs. about firing him for not being funny in the film. In the same interview, he also shared that his acting coach for the film was David Proval, who would go on to play Richie Aprile on The Sopranos. 3. NICK NOLTE AND EDDIE MURPHY WERE NOT THE STUDIO'S FIRST CHOICES. 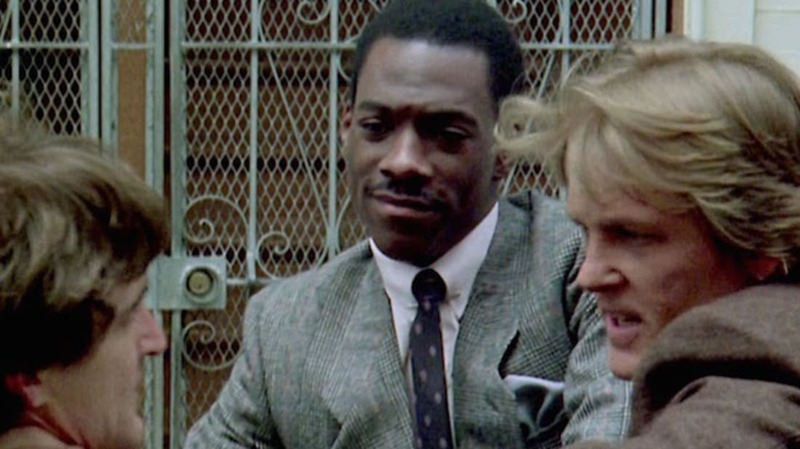 According to The Telegraph, several actors turned down the roles of Detective Jack Cates and Reggie Hammond before Nick Nolte and Eddie Murphy signed on. Mickey Rourke, Clint Eastwood, and Jeff Bridges were reportedly offered the detective role, while Gregory Hines, Richard Pryor, Howard E. Rollins Jr., and Denzel Washington all ultimately passed on playing the convict. 4. IT BEGAN AS A KIDNAPPING STORY. 48 Hrs., as the world knows it, is a story about an odd couple of cops trying to catch a killer, but that's not how it was originally written. In a 2009 interview, director Walter Hill shared the story of how he became involved with the project and how it changed over time. "[Producer] Larry Gordon had an idea for a crime movie set in Louisiana where the governor’s daughter is kidnapped, and has dynamite taped to her head, and the bad guys are going to kill her in 48 hours," Hill explained. "The family assigns a top cop to rescue her—one aspect of the story was the cop getting one of the kidnapper’s old cellmates out of jail to help him." The story was rewritten a few times and tailored for Clint Eastwood, who eventually turned it down. 5. MURPHY’S PERFORMANCE WAS INSPIRED BY BRUCE LEE. 6. THE FILM EARNED MURPHY A GOLDEN GLOBE NOMINATION. In 1983, 48 Hrs. was nominated for a single Golden Globe award—for Eddie Murphy as “New Star of the Year.” He lost to Ben Kingsley for his portrayal of the titular character in Gandhi. 7. THE FILM WAS BIG FOR RACE RELATIONS, ACCORDING TO NOLTE. 8. ONE SCENE MADE EDDIE MURPHY A STAR, SAID ROGER EBERT. 9. 48 HRS. LED TO ANOTHER SNL MILESTONE FOR MURPHY. Having already been the youngest cast member years prior, Eddie Murphy was also the first Saturday Night Live cast member in history to host the show while he was still on it, but that was not the plan. On December 11, 1982, Nick Nolte was supposed to host, but he was sick and had to back out at the last second. "When Nick got here, and got off the plane, he vomited on my shirt," Murphy said in his opening monologue, "and we realized Nick was too sick to do the show. And that's too bad, because Nick was gonna be in some real great stuff tonight." He added that because the audience came to see someone from the film, he was going to be the host, and he famously kicked off the episode with the line: "Live, from New York, it's The Eddie Murphy Show!" 10. BY THE SEQUEL, BOTH MEN GOT MAJOR PAY INCREASES. According to Epix, as the newbie, Murphy was only paid $450,000 to do the first film, while the more experienced Nolte was paid $1 million. After the success of films like Trading Places (1983), Beverly Hills Cop (1984), The Golden Child (1986), Beverly Hills Cop II (1987), and Coming to America (1988), Murphy’s paycheck for Another 48 Hrs. (1990) jumped to $7 million, while Nolte got a relatively smaller bump to $3 million.